IRS Form 4952, "Investment Interest Expense Deduction" is a tax form issued by the United States Internal Revenue Service. The latest version of the form was released in January 1, 2017. A up-to-date fillable 4952 Form in PDF is available for download below. The "Investment Interest Expense Deduction" can be filed digitally and submitted online or printed out and sent to the IRS mailing address. Go to www.irs.gov/Form4952 for the latest information. 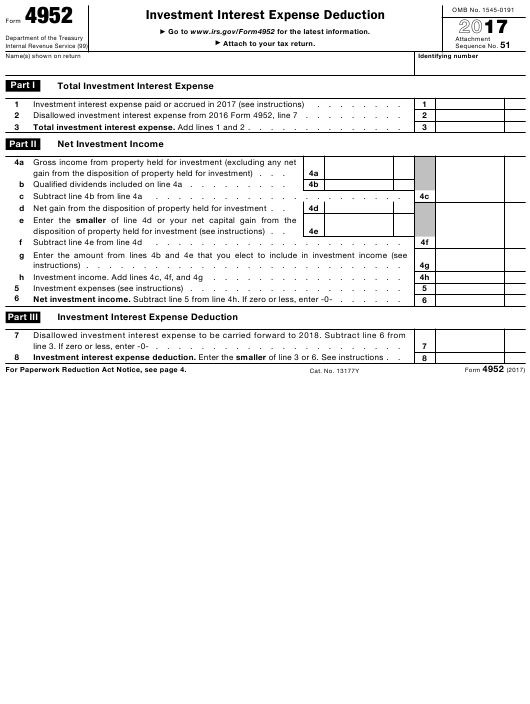 Disallowed investment interest expense from 2016 Form 4952, line 7 . Total investment interest expense. Add lines 1 and 2 .
gain from the disposition of property held for investment) . b Qualified dividends included on line 4a . d Net gain from the disposition of property held for investment . disposition of property held for investment (see instructions) . Investment expenses (see instructions) . Net investment income. Subtract line 5 from line 4h. If zero or less, enter -0- .
line 3. If zero or less, enter -0- . Investment interest expense deduction. Enter the smaller of line 3 or 6. See instructions . for investment, but only if you didn't materially participate in the activity. investment income from an estate or a trust. the transition rule of section 1.7704-1(l)), for details. At-Risk Rules, or Regulations section 1.469-2(f)(10). claim a deduction for your investment interest expense. Exception. You don't have to file Form 4952 if all of the following apply. included on line 4a. See the instructions for Form 8814 for details. any qualified dividends is more than your investment interest expense. • You don't have any other deductible investment expenses. property held for investment. Instead, enter it on line 4d. instructions for Form 1040, line 9b (or Form 1041, line 2b). activity interest. See Pub. 535, Business Expenses. that is allocable to property held for investment (as defined later). term capital loss from the disposition of property held for investment. see the Note in the line 4g instructions. bond on which the interest is includible in gross income. Investment interest expense doesn't include any of the following. of property held for investment are excluded from investment income. • Interest expense that is properly allocable to a passive activity. Instructions for Form 8582, Passive Activity Loss Limitations, for details. election can be revoked only with IRS consent. in investment income (don't enter more than the sum of lines 4b and 4e). Also enter this amount on whichever of the following applies. • The Schedule D Tax Worksheet, line 3. • Schedule D (Form 1041), line 25.
doesn't include an interest in a passive activity. (or Form 1041, line 2b(2)), by any part of the amount on line 4g. expenses for that trade or business. included on Form 6198, line 4—see below) on Form 1041, line 10.
report other expenses for that trade or business. Minimum Tax—Individuals, or Schedule I (Form 1041). amended return and file it at the same place you filed the original return. expense, directly connected with the production of investment income. investment income is an investment expense. partnership or an S corporation. determining your income or loss from a passive activity. 1040), line 23; or (b) the total on Schedule A (Form 1040), line 27.
assembling, and sending the form to the IRS, 13 min. which this form is filed.